Car company Daimler has stepped up the requirements for emission values for interior vehicle components by 50%. In view of this, clip fastener and prototyping assembly systems specialist ARaymond along with Johnson Controls and Ticona are addressing fastening systems for seat covers for the Daimler B-Class using Ticona’s latest POM material. ARaymond has been using Ticona’s low-emission grades since the very first XAP generation in 1998. In this new venture, the three companies took the challenge to meet the new Daimler guidelines with the XAP2 polymer grades. The basic impulse for the new XAP2 is the low emission levels, a goal which Ticona says it has been pursuing quite successfully. Guideline VDA 275 by the German Association of the Automotive Industry (VDA, Frankfurt) defines the regulations for formaldehyde emissions for plastic components in vehicle interiors. Daimler intensified its delivery specifications with regard to VDA 275 values in order to comply with current and future emission requirements in particular. Therefore, Daimler prescribes stricter limit values to POM components (polyoxymethylene) as of 2012. The minimum emissions are setting new standards for POM and Ticona says it has a specification limit value of less than 2mg/kg (2ppm) for uncoloured natural POM grades, for coloured or custom grades less than 5 mg/kg (5ppm). These Ticona specifications for XAP2 products give processors a degree of security with regard to being able meet the stringent limit values of Daimler. 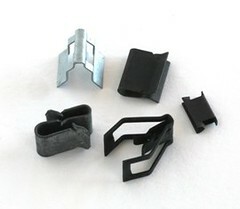 The first results of the development project were fastening clips for the latest B-Class, which permanently connect the seat covers to the seat construction. According to Ticona, the benefits of this polymer make it an appealing material for visible components as well as for elements concealed within automotives. This also applies to function and safety components. Seat components such as head rests and lumbar support, fastening solutions in the door area and trim for door elements, IP panels and centre consoles.